 Great place to live submitted by Hannah R. - Nov 01, 2017 |Recommended: YesSlatersville Mill is a great place to live. We have raised our puppy in this apartment and we have minimal complaints. The office is very friendly and they always greet us and our puppy like we are close friends, which I feel makes it an even more comfortable place to live. Highly recommend Only complaints Neighbors have overflowing decorations infront of their apartment, which looks tacky and gets in the way of me walking to and from my apartment door. Only other complaint would be the dog fur and poop that is found in the grass. So far, We love it submitted by Joan H. - Jul 24, 2017 |Recommended: YesThe location is perfect for my husband and I. 15 min. to work for both of us. Most of the people here are very nice. The staff is fantastic They are very helpful and polite. We love to walk our dogs the grounds are beautiful..
Beautiful grounds, peaceful living submitted by Kim L. - May 21, 2017 |Recommended: YesOur 2 bed 2 bath loft style apartment is fantastic. Plenty of room for the three of us. The amenities are awesome and best of all its pet friendly. Overall a safe community with beautiful grounds and a wonderful management team. Melinda goes above and beyond. So happy to call this our home. A clean & friendly community...submitted by Susan L. - Feb 14, 2014 |Recommended: YesIts very peaceful, Comfortable ,with an awesome Maintenance crew who go above & beyond.. The management staff is terrific as well..
Beautiful place to live. I feel at home.submitted by Terry D. - Jan 01, 2014 |Recommended: YesI feel safe. I love the convenience of the trash pick up, the mail, and the gym. I don't have to shovel. Loved it!submitted by Anthony J. - Nov 16, 2013 |Recommended: YesI don't live here anymore as I relocated to Florida however when I did I absolutely loved it. If I move back to Rhode Island, I would look to live here again. Slatersville and North Smithfield are wonderful places to live in Rhode Island. Alicia in the rental office is wonderful! Getting Bettersubmitted by James B. - Oct 02, 2013 |Recommended: YesIt is good. Suggestion. I always thought it would be a good idea to have an air pump and vacuum in the back of the property. Residence would use frequently. Also, maybe a newspaper machine in the mail room? Thanks! It is a nice place and quietsubmitted by Ronald S. - Sep 20, 2013 |Recommended: YesIt is a very nice place and my building is very quiet. The resident manager is very pleasant and helpful. It's a nice place to live but has downsides.submitted by Phillip B. - Sep 07, 2013 |Recommended: YesIt depends on where you go, some places are noisy but that's what you get with apartments. The upsides for me out weigh the downsides but it's all about what unit you get and if the new management are able to improve some of the issues with the complex or if they make matters worse. Love it!submitted by Jaclyn M. - Sep 06, 2013 |Recommended: YesI love it here! The staff is awesome and extremely helpful. Maintenance always responds to work orders right away. Tons of parking and the grounds are well maintained. It is a great place to live!submitted by Judi R. - Sep 01, 2013 |Recommended: YesAwesome, people are very friendly. It is very convenient to everything you need or want . A very pretty area and many ammenities included. The staff is above and beyond!